How I’ve resisted this product for so long, is beyond me! It’s a complete game changer in my opinion and the stuff actually works! Skin care guru Caroline Hirons (anything this woman doesn’t know about skin/ skincare isn’t worth knowing! 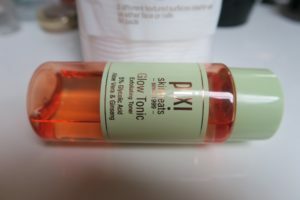 Check her out here) has raved about the Pixi Glow Tonic for years, as have countless others, securing it’s cult status and I still hadn’t tried it until recently! Shocking I know, haha. Pixi’s Glow Tonic (Available from M&S) is basically an acid toner, so saturate a cotton pad and sweep the product across your face and neck (also decolletage if you’re feeling fancy, I usually don’t and just with most things like this, just avoid your delicate eye area) after cleansing and before any of your moisture giving products. It’s suitable for all skin types and after using it myself, in my opinion this would be an effective addition to anyones skincare routine, however pretty much anyone over the age of 25 should grab a bottle and give it a go now! It helps to firm, tighten and tone the skin, whilst removing all dead skin cells and gives you clearer, healthier and noticeably glowy skin. It also claims to gradually diminish signs of sun damage, fine lines, scarring and other imperfections, which if my skin is anything to go by so far, I’d say this is definitely possible! It’s alcohol free and gentle even on my sometimes sensitive skin. I think this was a contributing factor to me not trying it for so long, the worry of it being too abrasive, which I now know couldn’t be further from the truth! Considering it’s effectiveness, the Pixi Glow Tonic is a pretty affordable option for this kind of product. It’s £18/ €23.50 for 250ml and is also now available in a travel friendly 100ml for £10/ €13.50, which is also a great option if you want to give it a go before forking out on the larger size too. I picked up the smaller one initially (mainly to see if it suited my skin) and it’s lasted for ages! I’ll be using the smaller size for travel and will most definitely be repurchasing and most likely the larger size, for every day use, the large is better value. It’s been ages since I’ve found something that makes this much difference to my skin! It actually does deliver on all it’s claims and I’m seriously impressed. I find that because it does remove dead skin cells and resurfaces, my moisture products sink in so much more evenly and are therefore more effective too. My makeup is applying so much smoother and sitting way better than before too and when I’m having a no makeup day, my skin looks significantly clearer and more radiant. Definitely lives up the hype and very much worth it in my opinion…love the stuff! Get it and give it a go yourself here!